Before we arrived in Europe I joined pinterest for a short, brief period. I mainly joined to look at all of the different wanderlust photos that people posted up and to be fair, most of those gorgeous places were already on my list. 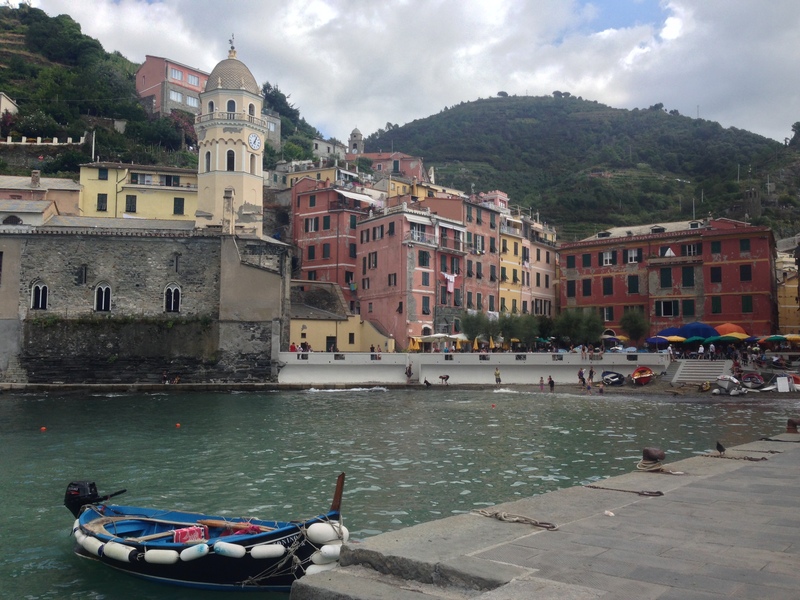 One place that wasn’t yet on the list that kept showing up was Cinque Terre. The beautiful colourful Italian homes perched precariously on the side of the cliffs were a must-see and it was promptly placed on the bucket list. The Cinque Terre are five towns on the coast of Italy. The towns from top to bottom are Monterosso al-Mare, Vernazza, Corniglia, Manarola and Riomaggiore. The area is easily accessible from Frankfurt and to save on time to fit into an extended long weekend, we chose to fly. Ryan Air flies to Pisa with a flight time of a little over an hour and flights are more often than not some of the cheapest you will find in Europe. We travelled for around $60 each, return. From Pisa airport we trained to Pisa Centrale station, where we opted to a photo opportunity at the Leaning Tower of Pisa (much smaller than we imagined!) 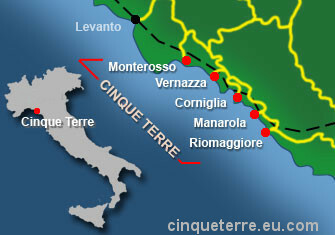 but you can head straight to the Cinque Terre without stopping. We took the bus from the airport straight to the area beside the Leaning Tower and tickets cost about 2 euro on board. After taking our photos we chose to walk back to the station as we still had some time before our train and our bus ticket had just expired. Pisa, as most people say, didn’t appear to be worth more than a quick stop to see the tower and we were glad that we weren’t staying the night. Number one wine in Italy! We were waiting on the platform for our train and slowly but surely the trains kept pulling past and none of them seemed to be our train. It was quite confusing as none of the trains had any kind of identification on them saying where they were going. It turned out that our train ended up being two hours late due to a strike in Tuscany. I had booked our train in advance for the reason that it was supposed to be a direct fast train to Monterosso. It ended up being not so fast, but at least there weren’t many stops. There was a rather talkative Italian man who we ended up sitting opposite that made for an exhausting hour train ride. Next time I am checking to make sure our reservations aren’t at a table! 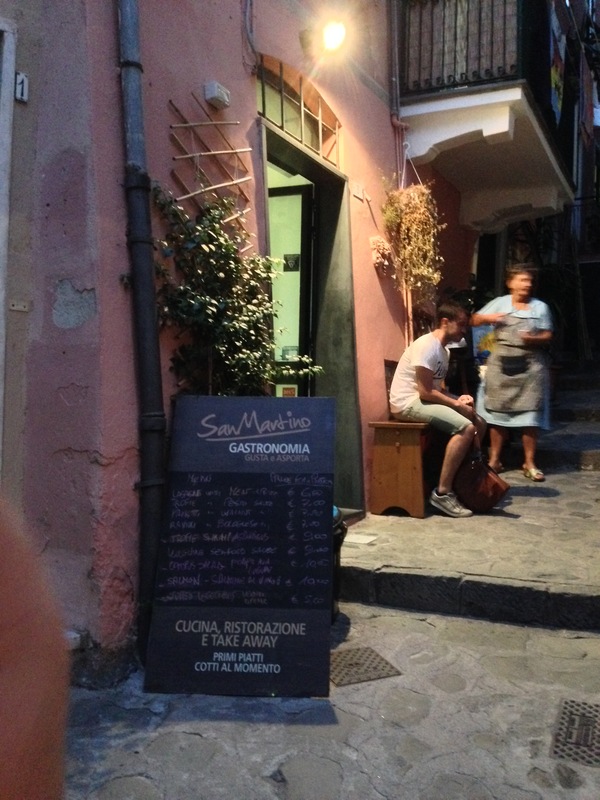 It was dark when we arrived at Monterosso. The lady who owned our apartment gave us great directions, but we ended up questioning them on arrival as it didn’t seem to make sense. In the end had we just followed her directions we would have been fine. The temperature was perfect and we arrived to the sound of crashing waves. It was a stunning arrival and I think that Monterosso is probably one of the most picturesque places in the world to arrive at on the train. 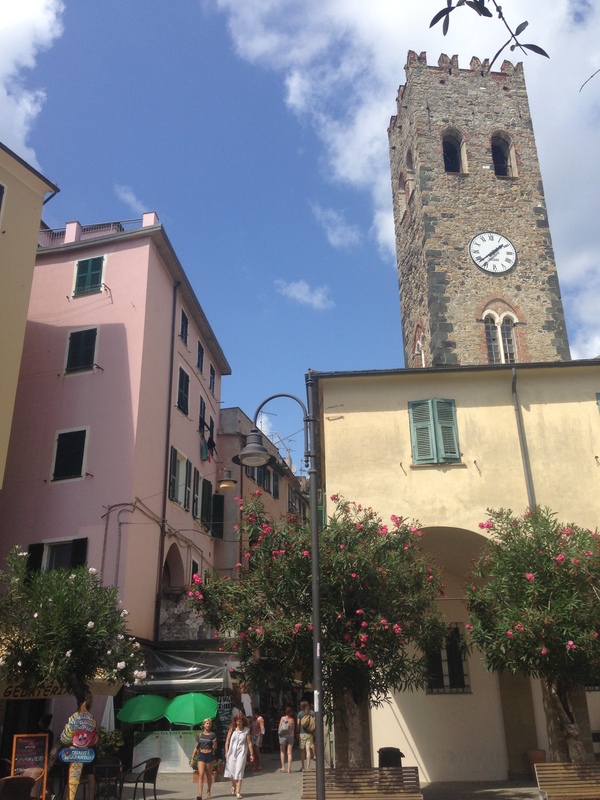 We eventually made our way to the main square of Monterosso where we were met by the lady who owned our apartment. If anyone wants an accommodation recommendation for the area then I absolutely recommend where we stayed. The name is ‘Il Portico’ and it was on booking.com. The apartment was absolutely massive and had sea views from the window, all while being right in the main square of the old town area. It was incredibly romantic and had everything you would ever need. We quickly headed down to find food, which thankfully for us was right outside our doorstep. It was already 2100 by the time we arrived and we were really happy that the Italians eat late. Nick had a delicious plate of Frutti di mare (fruit of the sea – pasta with shellfish) and I had my first of many pesto pasta plates. Yum! We woke to another beautiful day. Not too hot, but not cold at all. It had always been our plan to go hiking on the Saturday, so we woke up and headed out in work out gear to start to tackle the hiking paths. First call of the day was to find some delicious food. 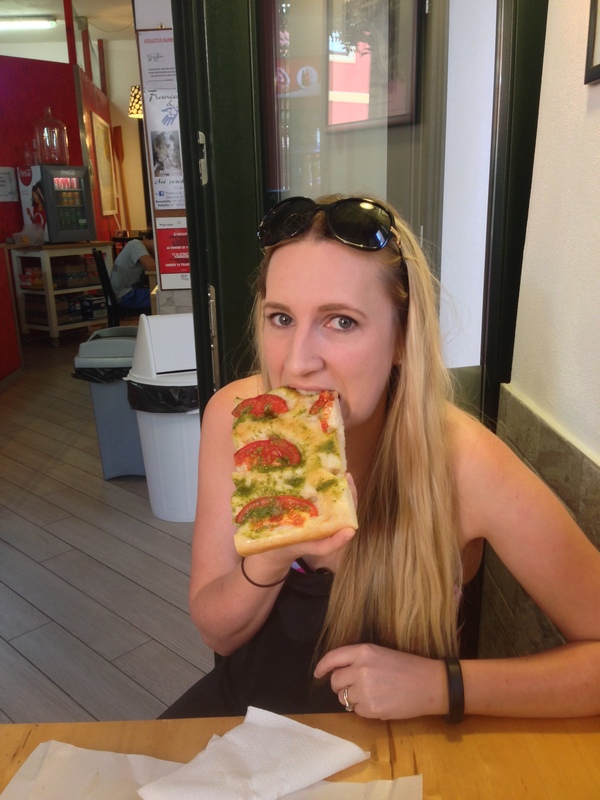 We ended up grabbing some delicious focaccia – which originated in the area so it made for some authentic food. I can’t even explain how delicious fresh pesto and tomatoes is on some just baked focaccia, but it’s outrageously good and I highly recommend it. Plus, it’s a cheap eat! Our goal had been to hike to Vernazza, which I had read was the most difficult of the four paid-for paths. We paid for our hiking pass and decided to go with just a day pass since we didn’t think we would hike for more than the one day. It cost around 10 euro each and apparently included access to the toilets and wifi, but we never saw a toilet so I’m not sure what the facilities were. The hike took us a little over two and a half hours but we had several picture/water/admire the beauty stops. I loved the hike. It was challenging at times and it was a little perilous in areas. I wouldn’t want to do that particular hike if the weather was bad or if it was wet and I also wouldn’t want to do the hike with small children. We did see some people baby wearing on the walk and there were a couple of families with older children. There are no barriers though, and at points there were sheer drops down the sides of cliffs. Other walks are apparently much easier and less dangerous, but I believe that the views on the hike path we did are apparently some of the best. Once we arrived in Vernazza we walked around and checked the town out. 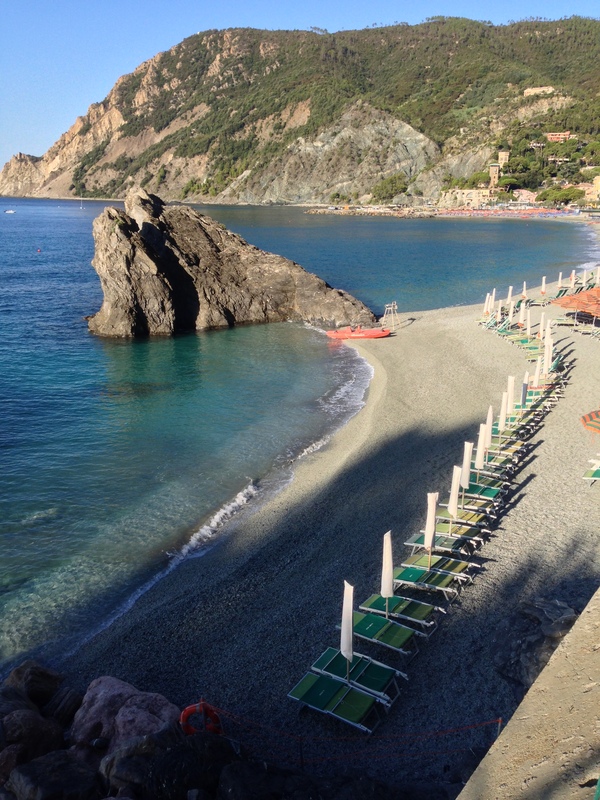 It was a beautiful town but we were glad that we were staying in Monterosso as it felt like it had more of a ‘happening’ vibe with more restaurant variety and sandy beaches. We eventually bought a train ticket and took a quick, less than five minute train ride back to our village. We kind of laughed at each other over how short the ride through the tunnel was compared to how much effort we had to put in to hike over the cliffs. It only seemed fair after all that effort to go for some delicious food. We wandered the small alleyways that make up the village and eventually settled upon a pizza and pasta restaurant. It was kind of funny sitting there as we heard so many different accents. The village seems to attract lots of Italians on the weekends but we were seated beside a kiwi couple and an American couple. I went for the tricolore pizza (marina with pesto swirls) and Nick went for seafood pasta again. My pizza was on point, I just couldn’t get enough of the pesto! Apparently the area was also where pesto came from as basil plants grew like crazy on the hillsides. After a fun filled day of hiking we had two choices to spend our Sunday. Either we could go and spend a ridiculous amount of money for a beach chair, as somehow the whole of the beach is owned by private companies or we could go hiking again. We chose the latter, we decided we wanted to try and hike the rest of the four towns over the course of the day. 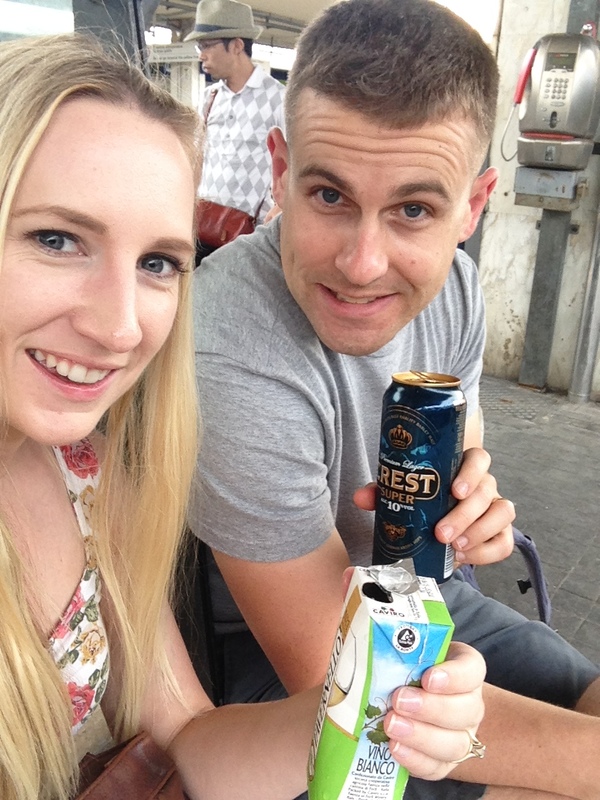 After quickly grabbing some lunch, we made our way to the train station. We only had to wait a couple of minutes before an almost empty train arrived to take us to the end of the Cinque Terre line – to Riomaggiore. On arrival, the town seemed buzzing. There were a lot of tour groups there and many people milling around, almost seeming lost in a way. As it turned out there was a reason for that. Had I done a little bit more research before we left, I would have discovered that the closed trails from a flood in 2011 were actually still closed. I just assumed that given four years had passed that they would have reopened by now. We went to buy our hiking day pass and the man quickly told us there was no point as we could hike the more difficult trails for free. The thing was, the closed path should only take 20 minutes to get to the next town. The difficult, free trails would take over three hours. Yeah, we weren’t feeling that adventurous. All of the paid-for (read: easier) trails were closed except for the one we had done the day before and Vernazza to Corniglia. We headed back to the train station a little disgruntled and waited for the next train to take us to the next town. We kept waiting, and waiting. The crowd on the platform kept growing until it was bursting at the seams. The train pulled in and for want of a better term, all hell broke loose. People were pushing, the crowd was surging, people were screaming (well, it felt like it) and several different languages were merging into a panicked cry. Everyone wanted on that train as I guess there was only one an hour. Nick got on first and pushed through the crowd with me languishing on the platform. I got surrounded by a tour group and as they all pushed on the train, I somehow got picked up amongst them and pretty much carried on. There was no point resisting the wave and I just managed to go with it. Through a mixture of ESP and reading of lips, we decided there was no way we were going to try and get off that train. We didn’t get to see the middle two towns of Corniglia and Manarola but in the end it didn’t really matter. Three out of five and perhaps we’ll go back another day when the trails reopen. Looks legit – was legit. That afternoon we were a little perplexed on what to do. It was too late to get full worth out of paying for a spot at the beach, so we decided there was really only one thing to do. Eat, drink and be merry! First of all, we found a wine bar and ordered an appetizer and tried the local wine. We then indulged in gelato and Prosecco until it was finally dinner time. I had looked up tripadvisor on arrival and come across one of the top rated restaurants. It was always full when we walked past there as there were only four outdoor tables (who wants to eat inside on a beautiful night?) This time we got lucky and quickly sat down. Nick had an octopus salad that he had been lusting over and I had the local specialty of a pesto potato pasta. Our meal was delicious, but not quite filling enough after our bellies had been expanded by all of the amazing food we had been eating. On the way back to our apartment we happened to pass by the pizza and pasta place from the night before. We picked up another tricolore pizza, beer and headed down to the harbor that was just down from our apartment. The water looked extremely inviting in the dark, but we didn’t have our swimsuits with us and Nick wasn’t keen to get arrested in a foreign country. Instead I decided to dip my feet in as I hadn’t even touched the water all weekend. I couldn’t believe it – it was like bath water! The water was so warm and the perfect temperature to get into, even at night. Alas, I never got to submerge myself in it but I hope we can go somewhere next summer that has just as warm water. It was sadly time to leave this beautiful area of Italy. Our train was around breakfast time, but thankfully we had leftover tricolore pizza to start the day off well. Who said you can’t have pizza for breakfast? Our train ended up being kind of like a Eurotrip situation. Who knew that there were so many cabins in a train? We ended up having to enter a quiet cabin full of Italians (instead of the other cabins that all seemed to be jovial tourists). There was even a nun in our cabin. Needless to say we ate our pizza outside the cabin and kept quiet. All of them ended up getting off at the same station and we were able to breathe a huge sigh of relief for the last 15 minutes of the train ride. We took the Pisamover from the Pisa train station and headed straight to the airport, which was a short, less than ten minute ride. I was sad to say good bye to Italy, but funnily enough for the last day I ended up having the biggest craving for nachos. I guess I’m turning into an American!